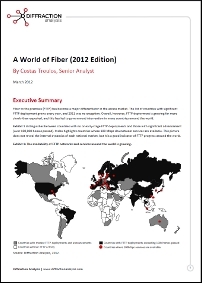 Fiber to the premises (FTTP) has become a major differentiator in the access market. The list of countries with significant FTTP deployment grows every year, and 2011 was no exception. Overall, however, FTTP deployment is growing far more slowly than expected, and this has led to government intervention in many countries around the world. This free report, written by Costas Troulos, examines the developments in FTTP on a country by country basis and highlights the important experiences, the rousing successes and the unfulfilled promises. Click on the image above to download this report for free. Fiber to the premises (FTTP) has become a major differentiator in the access market. The list of countries with significant FTTP deployment grows every year, and 2011 was no exception. Overall, however, FTTP deployment is growing far more slowly than expected, and this has led to government intervention in many countries around the world. This report examines deployment dynamics around the world and their implications for service providers, vendors and policy makers.